From Kirsty Baird - Community Sport Hub Officer. Thanks very much for coming to last week's meeting, please see the notes attached, I'll be following up on my action points as soon as possible. ust a reminder we have the East Caithness Community Sport Hub on Tuesday 5th March 6.30-7.30pm in the PE classroom (no longer dance studio), we will be look at the year ahead, the needs for your club and the community. Reminder - 2019 club profile for sportscotland and governing bodies monitoring and the 2019 club affiliation to your local Community Sport Hub. A competition which brings surfers from across Scotland to compete for a national title has been awarded £5,000 from EventScotland's National Programme Fund. The take place from 19-22 April 2019 in Thurso. 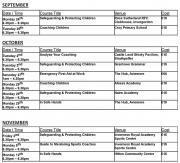 Quick reminder of child protection course on next Wednesday in Thurso, and other dates for child protection officer training and first aid will be available soon: Safeguarding & Protecting Children - Wednesday 12th December, Thurso High School 6.30-9.30pm This workshop and resource meets the basic foundation requirements for safeguarding and protecting children and young people in sport, for anyone whose role brings them into contact with children and young people. Recognised by UKCC and lasts 3 years. Training times are Thursdays 5.00 - 6.30pm at Naver All Weather Pitch and Sundays 1.30 - 3.00pm at Halkirk Football Pitch. Any one interested contact Stewart Munro (Coach) - Mob No 07810731849 Home No 01847 831382 E-Mail josamar1@outlook .com. See poster for the times and places. Come and Try Badminton. Why badminton is a great way to keep you active. Easy to learn, fun and sociable, badminton is a great way for people of all abilities to keep active. 40 years of failure: can sport and leisure bridge the empathy gap? This article in "the leisure review" talks about what has happened in England but applies to Scotland also. Are we failing here also to involve everyone? After a long career in sport and leisure Martyn Allison offers a personal perspective of a sector that, for all its achievements, has failed to recognise or address its biggest challenge. A research study published in the Lancet reports that physical activity can have a significant impact on mortality rates. The findings will come as a surprise to almost no one but the study, which is the first to explore the relationship between heart disease and physical activity in nations of differing levels of affluence, will add to the weight of evidence supporting investment in physical activity promotion as part of the UK government's efforts to promote healthy lifestyles. The group advising the Scottish Government on getting more women and girls physically active and into sport is to focus on the particular barriers to participation that affect different groups. The Women and Girls in Sport Board, which is made up of representatives from sport, business and the media, has set out its work programme and also revealed its new brand and visual identity. Highlife Highland have an increasing range of courses aimed at coaches and anyone involved in running groups. More new course are being added all the time so keep and eye on the Calendar HERE. The next hub meeting is planned for Tuesday the 25th of September 2018, 6.30-8pm in East Caithness Community Facility's dance studio. Please find the next meeting's agenda attached; the previous presentation from Katie Matthew's and the meeting notes from the last meeting. Bike scheme for elderly rolled out across Scotland. Older people across Scotland will be able to stay active and socialise through an innovative cycling scheme being rolled out nationally. Following recent community engagement on the establishment of an East Caithness Community Sport Hub, we are delighted to announce that the Hub's first meeting will be in held in Wick. Sportscotland Partnership Manager, Garry Reid will officially open the Hub's first meeting which will be chaired by Katie Matthews, Community Sports Hub Officer for the North Highlands. Five University of the Highlands and Islands students have been awarded scholarships from international golfing organisation, The R&A. Jamie Macintosh (18) from Inverness, Kieran McCormick (18) from Glasgow, Michael Schinkel (20) from Kirkwall, Alistair McNaughton (20) from Paisley and Riccardo Cellerino (23) from Italy have each received between £750 and £1000. An article in the Mail on Sunday has highlighted a move for Castle of Mey Highland Games to hold the first ever events for athletes with a disability. Hammer throwing and tossing the caber inspired by Alex Armor and ex US veteran. The partnership organisation to support companies operating in the mountain biking sector has received new backing from the Scottish Government. Tourism Secretary Fiona Hyslop has announced £50,000 for the Developing Mountain Biking in Scotland project for the coming year, to help them deliver on a national strategic framework for mountain biking.